​entered the game 11-5 winners of five straight games and did not let up as they were not very good hosts shutting down the Hurricanes 100-44. The Blue Devils never trailed, but the game was close at the end of the first quarter. Wickliffe jumped out to a 7-0 start 1:02 into the game. Six of the seven points came on a pair of three-point baskets by Junior Anthony Olsen, his night was just beginning. The Hurricane made a run and closed the score to 7-5 with 4;50 left in the first quarter on two consecutive jumpers by Hurricane’s Senior Hunter Majewski. Brooklyn closed to within one point at 14-13 with 2:40 left in the first quarter Senior Hunter Smith hit a three pointer. The Hurricanes once closed the score to one point at 21-20 with :34.4 left in the first. Olsen hit a free throw with :28.0 left in the quarter to give Wickliffe a 22-20 lead at the end of the quarter. Olsen finished the quarter with 17 of Wickliffe’s 22 points. The second quarter was ugly if you were a Hurricanes fan as the Blue Devils outscored the Hurricanes 38-10. The Blue Devils went on runs of 7-0, 20-0 and 11-1 in the quarter to cement the result of a win or loss and lead by 30 points at 60-30 at the halftime break. At the half Olsen led all scorers with 27 points. 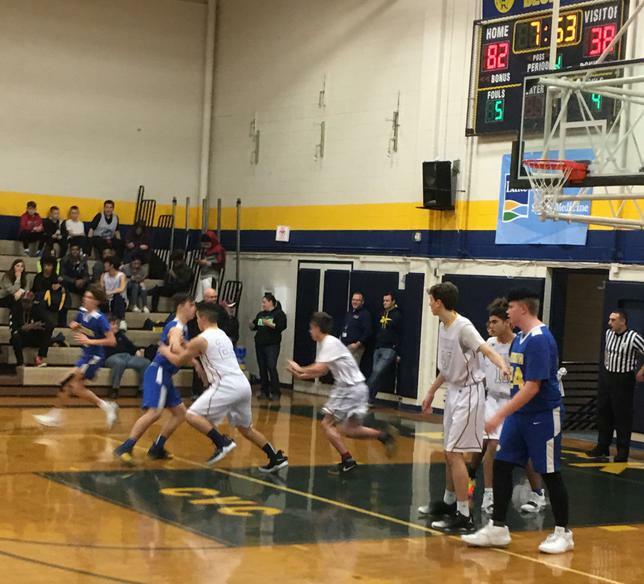 Things did not get any better for Brooklyn in the third quarter as Wickliffe outscored the Hurricanes 22-8 to take an 82-38 lead into the final quarter. Olsen scored his final seven points in the third quarter to finish the night with 34. Coach Marc Lewis pulled his starters in the fourth quarter and the Blue Devils still had a nice quarter, as Lewis has said many times that his second team is as good as his first team. The Blue Devils outscored the Hurricanes 18-6 to finish off the dominating win. Sophomore Chase Fortkamp had 17 points in the victory for the Blue Devils. Fortkamp’s cousin Junior Gianni LaPaglia also contributed 12 points in the win. Majewski led the Hurricanes with 19 in the loss. The Blue Devils will be back in action on Tuesday night when they take on the Max S. Hayes Lakers at home at 6:30 p.m. .